Due to today’s great growth of the technology in combination with safety standards, engineers are developing a new generation of wireless systems able to support safety applications. This situation takes special relevance in the transport domain, where the inclusion of wireless systems for safety applications could improve the accident prevention, passive and active security systems or even the communication with emergency services in case of accident. The rail domain can be seen as an attractive market to deploy wireless systems, mainly because a great percentage of the current systems are based on wired solutions that can be replaced with modern wireless solutions. These new solutions could bring about important energy and money savings and an enhanced functionality. Nevertheless, the safety level required in most of the applications makes the acceptance of wireless technology difficult. The DEWI project was an important starting point in the adoption of the wireless solutions by the rail domain for safety applications. During the DEWI project, the feasibility to deploy wireless systems in this domain was demonstrated. Taking advantage of the work and results of the DEWI project, SCOTT is intended to progress on those works related to safe and secure communications. Currently, most of the systems are being developed taking into account energy efficiency standards. Low consumption and energy harvesting have also been identified as key drivers of the energy autonomous rail systems. Thanks to cloud platform systems, it will also be possible to centralize train/track data in cloud services, allowing new services to improve user experience, and to create new useful tools for train operators and infrastructure managers. A demonstrable wireless safety communication platform for use in dangerous areas (e.g., level crossing without barriers, works zones on the track, etc. ), where the previous lack of network infrastructure makes necessary to have an affordable workable system compatible with the current legacy infrastructure in order to compensate for the safety deficiencies of these zones (critical areas). A demonstrable first approach for a trustable Virtual Coupling solution for train sets based on safety-related vehicle to vehicle wireless communication technology and wireless sensor network technologies that will be able to perform a safe manoeuvre coupling and uncoupling between train sets. A complete (on-board and on-track) demonstrable secure wireless communication platform for rail logistics and maintenance applications including the integration with a cloud-based platform that will enable the future development of multiple cost-efficient applications. A demonstrable energy harvesting platform for rail systems that will make use of different energy sources (e.g., vibration, solar). 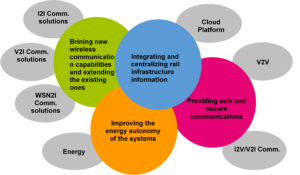 A reference architecture for wireless systems dedicated to provide enhanced communication capabilities to both on-board and on-track domains of rail traffic infrastructures.